Skin therapy in geriatric patients. QV Bath Oil is also suitable for infants, children, the elderly, pregnant women and nursing mothers. Leaves skin with a healthy looking glow. 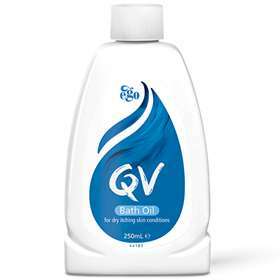 QV Bath Oil 250ml contains an active ingredient of light Liquid Paraffin. This belongs to the group of emollient medicines, which form a protective film on the skin surface and slows down the loss of water from the skin. Light Liquid Paraffin 85% w/w, Macrogol Lauryl Ether, Isopropyl Myristate, Propyl Parahydroxybenzoate (E216). For Bath: Adults: Add 10ml to warm bath. Children: 7ml to a half filled warm bath. Infants: 4ml to a baby's bath. Bathe for 15-20 minutes. Pat skin dry, do not rub. For Shower: Apply QV Bath Oil undiluted directly to wet skin, leave for a few minutes then rinse. Pat skin dry, do not rub. For Bed Patients: Add 4ml to 2 litres of warm water, sponge affected area. Pat skin gently dry, do not rub. Massage: Massage onto dry area. No need to wash off. Do not use if you have seborrhoeic dermatitis, acute dermatoses or if you are allergic to any of the ingredients (listed above). Do not use soap on affected areas. Take care when getting out of the bath or shower.